Go and get stuffed! Just kidding, but I do insist you go and stuff your eggplants and then stuff your face with them. I’ll be honest, these started out as my version of a Greek dish I had on holidays, but I found the resulting mince mix a little bland for my discerning taste buds, so I threw in some extra spices to give it some oomph. The result is my little eggplants don’t know if they are Greek goddesses or Spanish senoritas, but either way they are bloody delicious! Cut eggplants in half lengthways, then slice a crisscross pattern through the flesh with a small knife, taking care not to cut through to the skin, then lay them cut side up on a roasting tray. Drizzle flesh with olive oil and season with salt and pepper. roast for 30-40 minutes until soft. While they are roasting, make the mince filling. Heat a tablespoon of oil in a large pan and saute the onion, capsicum and garlic. Add the mince and brown it off. Add all the other ingredients (except the parsley and pine nuts) and mix together. Simmer on a low heat, stirring occasionally for 15-20 minutes. Keep warm until the eggplants have finished roasting. When the eggplants are done, scoop the flesh out with a spoon and add it to the mince mixture. You want to leave enough flesh attached so the cases stay intact and are sturdy to hold the mince filling, about 1/2-1cm thickness. 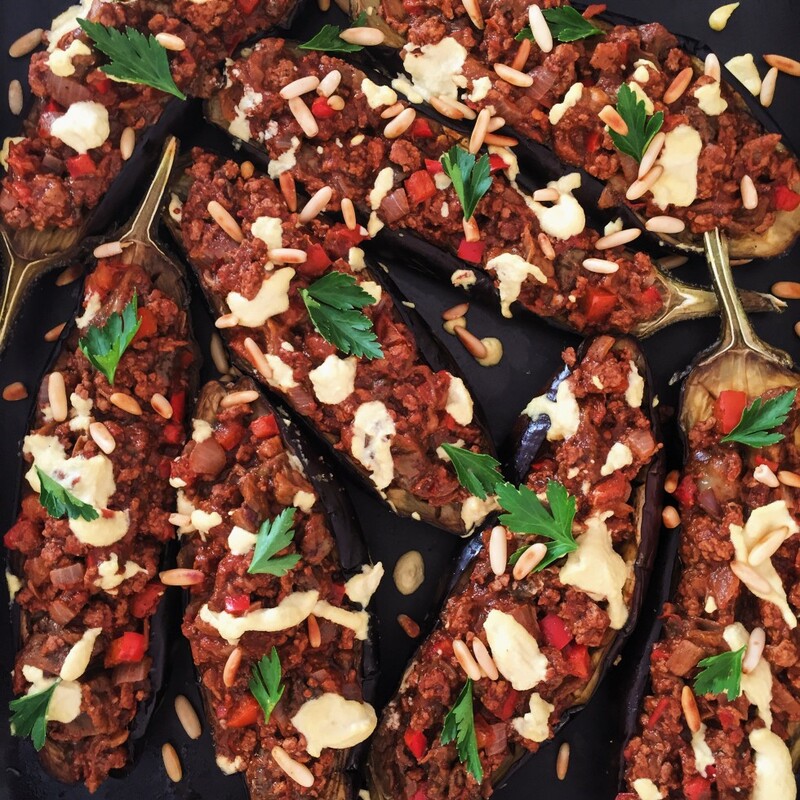 Spoon the warm mince filling back into the eggplant shells, garnish with pine nuts and parsley and serve with the cashew cheese. Drain the soaked cashews and rinse well. Chuck them in a food processor and whizz them for a minute or so to break them down. Add the nutritional yeast, mustard, salt and lemon juice and whizz together. With the machine running, pour in the vinegar and water. Keep whizzing until you get a creamy consistency.